A wine cask cracker from the Highland distillery Edradour! The Straight From The Cask range has a well-earned reputation for high quality, and that is certainly the case with this bottling. This single cask offering has been matured in a Burgundy cask for 11 years, developing an incredible, intense fruitiness, which marries well with the natural spiciness of the Highland spirit. Indeed, drinkers can expect flavours of fresh red grape, raspberries, cherries and strawberries, with some jammy plums, dark oak, wood spice, tannic wine, and sweet honey. Bottled at a hefty 58.2% ABV, without chill filtration or colouration, this whisky keeps all its natural flavour and body. 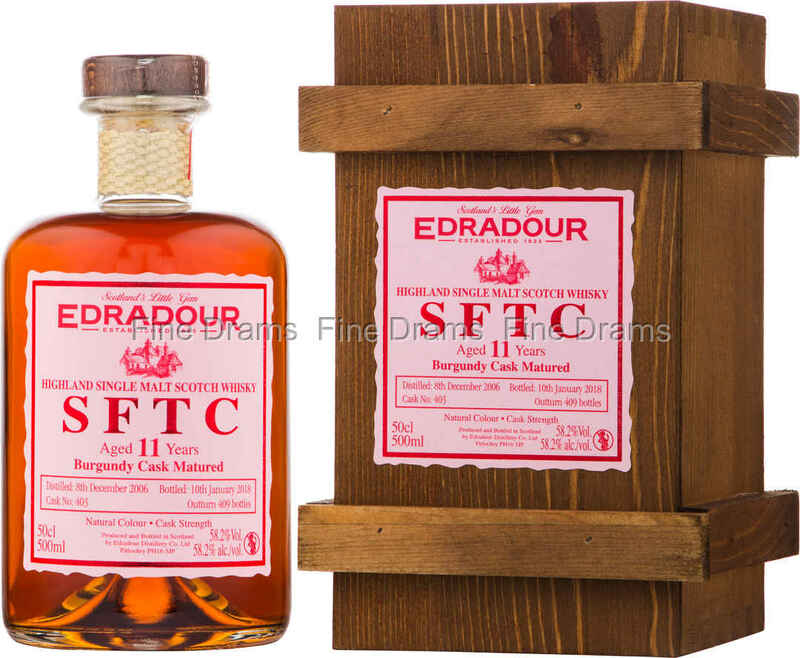 As a final touch, Edradour present this whisky with a charming wooden gift box, and eye-catching pink labels. Just 409 bottles were produced.